The summer meetings at the apiary are friendly and informative. 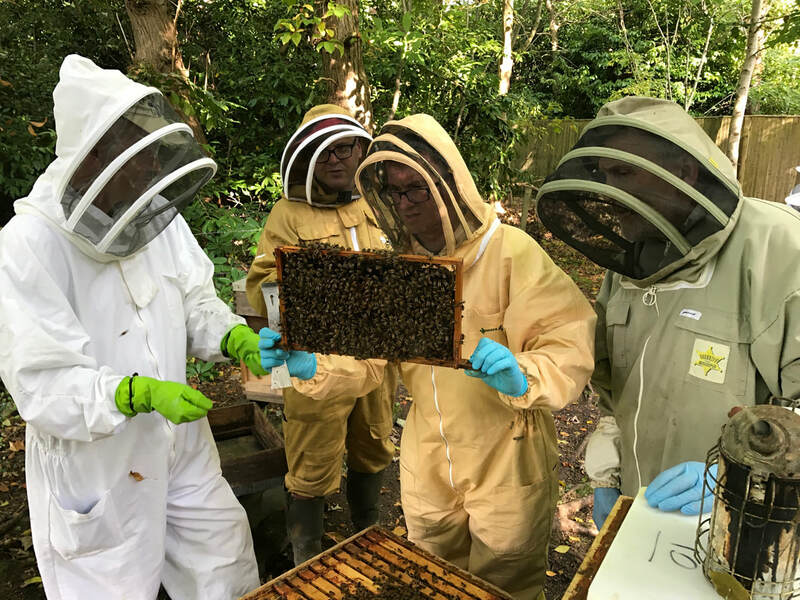 Some of our most experienced Members lead the regular checks of the hives and everyone else has the opportunity to handle the bees, to take part in the regular care of the colonies and to ask questions about the procedures. It is a unique opportunity to raise issues about your own hives and to discuss various ideas on bee care. You can keep up to date on how our bees are doing by following our Apiary Blog. Dates and location for apiary meetings are on the Meetings page. We have several spare bee suits of various sizes that may be borrowed for an apiary session. You will also need to wear long trousers and Wellington boots, and bring a pair of rubber gloves. You will then be able to get close to the bees while feeling safely protected. Apiary meetings are weather dependent !! If it is blowing a gale, continuously raining or cooler than 15 C meetings may be cancelled. Notice of cancellation will be sent by email.